You can enter 25 times per day, so make sure to repeat the process 25 times to get all your entries if you wish. 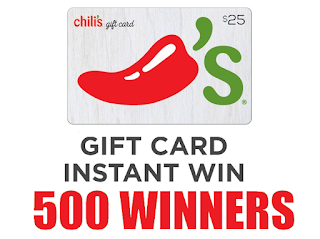 Prizes: 500 GRAND PRIZES: A $25 Brinker International Gift Card, fulfilled as a digital code, terms and conditions apply. Gift Cards are redeemable at participating Chili’s or Maggiano’s Little Italy restaurants. Approximate Retail Value (“ARV”): $25.